Citrus Express makes grapefruit even more yummy. You take half your grapefruit, core it, place it on the crown and turn. Your fresh grapefruit segments drop down into the bowl, swimming in juice as if they were canned grapefruit. All the sweetness and juiciness of the grapefruit is brought out. Citrus express grapefruit segmenter is fun and fast, particularly good if you have a lot of grapefruits to do. A Bed and Breakfast owner complained that a guest ate the whole help yourself bowl of Citrus Express prepared grapefruit. Order a Citrus Express and taste for yourself. 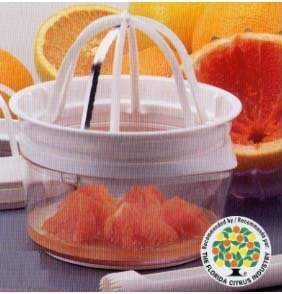 We will send you the Citrus Express bowl, corer, cutter and juicer lid. An extra FREE BONUS Orange Express cutter, juicer, corer for oranges and smaller citrus fruits. With extra free bonus attachments! and works on many other citrus fruits.